Note 8 lands a seamless smartphone experience as it is equipped with a 2.3GHz octa-core Exynos 8895 processor. 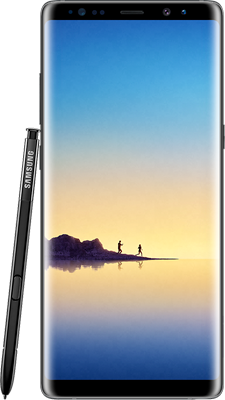 To help users with a lag-free multitasking environment, the device comes with 6GB RAM.The Samsung Galaxy Note 8 is a revolution in terms of its display. The device flaunts a 6.3-inch QHD+ Super AMOLED display that is paired with excellent viewing angles which allow users to read the screen without any difficulty even when they are out in the sun. On top, there is Corning's Gorilla Glass 5 protection which keeps the screen scratch-free. One can also expect stunning images with dual 12-megapixel rear cameras which feature dual RGB, and a monochrome sensor that can capture enough light to ensure better low-light photography. One can also expect stunning images with dual 12-megapixel rear cameras which feature dual RGB, and a monochrome sensor that can capture enough light to ensure better low-light photography.